You don’t just see how much exercise you’re getting yourself, but also how active your friends are. That’s the idea behind the ‘Bouncers’ app, which is launched today by researchers of the Department of Industrial Design at TU/e, together with ‘De Ondernemende Huisarts’ (organisation aimed at innovation in healthcare) and the City of Eindhoven. The social focus of the app makes users more aware of how much exercise they’re getting, and lets them motivate each other to follow a more active lifestyle, in the same way as they do in a sports club. 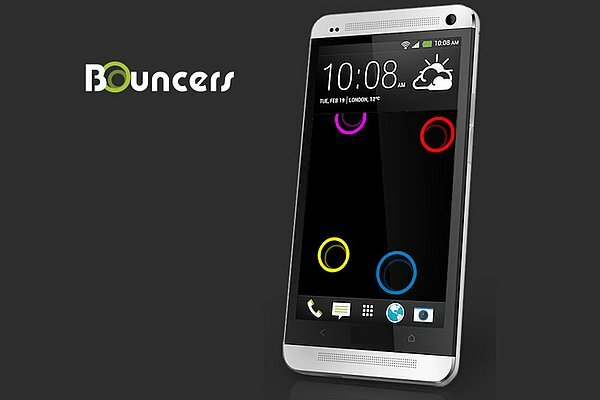 From today, Bouncers is available free on Google Play to everyone with an Android smartphone. The way the app works is simple: colored rings moving on the screen’s live wallpaper constantly visualize your own physical activity level and that of your friends. The more exercise someone is taking, the faster that person’s ring bounces across the screen. So you can see at a glance how your own lifestyle compares with that of your friends. Bouncers measures users’ activity by means of the motion sensor built into all today’s smartphones. A smart calculation translates the activity into the speed with which the user’s ring moves across the screen. Bouncers is constantly active in the background on the screen, but the researchers have been able to keep the energy consumption very low to minimize battery drain. The app falls within the TU/e Smart Environment research theme, which looks for methods and tools to help people lead healthier and more active lives. The development of the app is part of a collaboration project between the TU/e Department of Industrial Design, the City of Eindhoven and De Ondernemende Huisarts. The city is jointly funding the project, and De Ondernemende Huisarts now intends to test the effectiveness of the app among 100 Eindhoven residents.